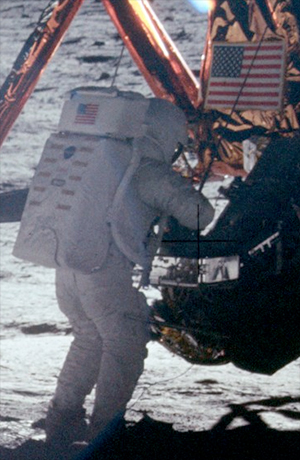 — There is only one photograph of Neil Armstrong walking on the moon, and in it, he has his back to the camera. Of course, there were photographs taken of Armstrong at other points during the moon flight, and on his previous mission, Gemini 8. Cameras were ready when he was named an astronaut seven years before walking on the moon, and were more than ever present after he returned to Earth as a history-making hero. To help illustrate that record, collectSPACE asked Retro Space Images to search their extensive archives of NASA photographs and pick out those that showed the Armstrong that the public didn't always get to see. The three dozen photos they chose have been presented chronologically, with one exception: the gallery below begins with the rare photo of Neil Armstrong walking on the moon.